Halperin and Heileman’s definitive account charting the course of the historical 2008 US Presidential election campaign may seem like an odd choice to include on an educational leaders reading list. However, the lessons from the candidates, their teams and their strategies are highly relevant to educational leaders. Many educational leaders surround themselves with quotes from famous politicians of history as inspiration, but this book looks at the actions of political leadership, set against the backdrop of the world’s biggest popularity contest. Cynics may argue that Obama’s fundraising won him the election. But a more nuanced reading of this account would highlight the importance of the teams surrounding the candidates, how the leaders shaped these teams and their own destiny. While politics may not be your cup of tea, the lessons for leaders and leadership teams here are timeless. You should look out for the differences between Obama and Clinton’s campaign teams. Game Change highlights Obama’s handpicked team that believed in him and his message, while front-running candidate Clinton relied too heavily on the loyalty of a few key players, leaving her message confused and reeling when they burnt out. You should read this book to understand why an experienced and principled leader like John McCain gambled his reputation on the wild card Sarah Palin. Also note the lack of strength in the team surrounding golden boy turned tabloid fodder, John Edwards. 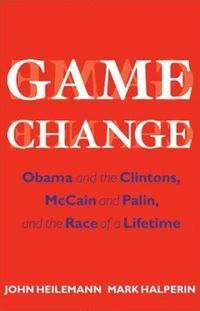 While Game Change is an outstanding insiders account of this historical election, educational leaders can use it to reflect on their own leadership, and the teams they build around them.